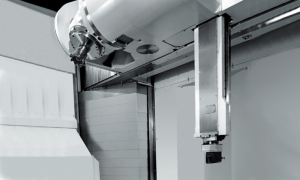 The INTEGREX e-RAMTEC Series encompasses machines that combine the capabilities of a machining center with those of a vertical turning center. 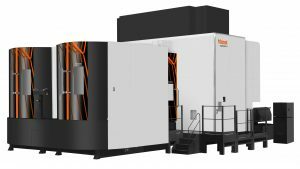 In addition to all capabilities of Mazak’s INTEGREX e-V II Series machining centers, RAMTEC machines feature ram spindles in addition to B-axis tilt milling spindles. The ram spindles allow for deep I.D. turning and machining and provide the ability to bore as well as do small milling and drilling with right angle heads. 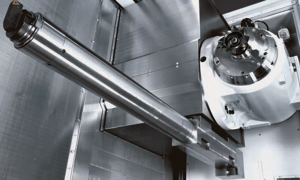 The ram spindle is mounted on the side of the milling spindle housing and has a vertical stroke of 900 mm so that not only turning but also milling processes by using an angle head can be performed. 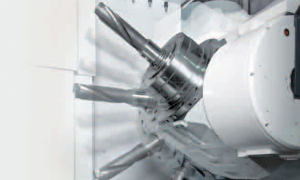 In order to perform a wide variety of machining, the ram spindle has its own tool magazine with a capacity of 40 tools. The ram spindle has a 7.5 kW (10 HP) milling motor for providing excellent performance from drilling and tapping to milling. The ram spindle uses CAPTO C6 tooling.